Courtesy of K&S Millwrights, Inc.
Every year we hear about tragedies and injuries in grain bins. Grain storage continues to get larger and large bins are used regularly on farms and commercial agriculture businesses. They are a necessary piece of equipment, but safety needs to be top of mind whenever entering a grain bin. Make safe entry a priority. Some bins can hold billions of bushels of grain. There are moving parts, entrapment and fall possibilities. There are best practices and safety guidelines in place for proper entry of grain bins. Always be cautious and aware of the situation. AgriNews recently shared an informative article featuring five steps to be safe with grain bin entry. 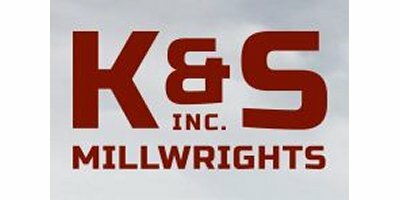 At K & S Millwrights safety is very important. All our staff are thoroughly trained on appropriate grain storage entry procedures. We also hold annual safety trainings to keep everyone updated on the latest advancements and to keep things fresh in their minds. We built these bins three years ago. Enough grain runs through the system that the augers wore out so we are retrofitting an air system on it to lengthen the life of the equipment. No comments were found for Grain Bin Safe Entry Tips. Be the first to comment!